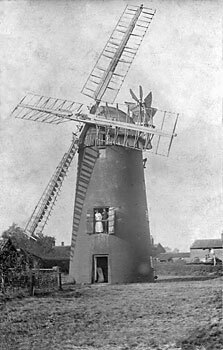 Runhall towermill was a four storey mill that had a Norfolk boat shaped cap with a petticoat that held a left handed 6 bladed fan. One sail had double shutters with 7 bays of 3 shutters and the other 3 sails had single shutters, all driving the 3 pairs of stones. By 1862 a bake office was being run on the premises. 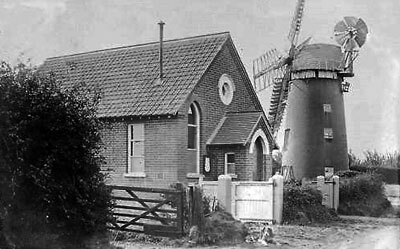 An excellent TOWER WINDMILL driving three pairs of stones, with Bake office, Dwelling House, Garden and all convenient and necessary Outbuildings. Possession immediate. For rent and particulars apply to Mr. C. C. Atkins, Land Agent, Coston, Wymondham. James Darby, Runhall, miller. May 2nd. Also a Brick TOWER WINDMILL driving three pairs of Stones, next the Public Highway and lately occupied by Mr. Dawby. Apportioned Annual Land Tax 10s. Apply to Fred Fox, Solr. Surrey Court, Norwich or the Auctioneers, Wymondham. To LET at Lady, a BRICK TOWERVWINDMILL, with House, Bake Office, Cart Shed, Stable and Garden adjoining. 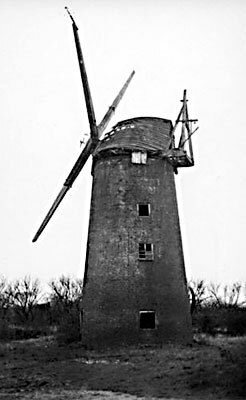 Apply to Mr. William Breese, Runhall, Norfolk..
A NEWLY ERECTED TOWER WINDMILL with 4 Patent Sails, driving two Pairs of French Stones, Machinery in excellent order and fitted with the latest improvements: - comfortable Dwelling house containing seven rooms, Bake Office, Stable, Cart Lodge, Piggeries, with large and productive Garden. Situated aout One Mile from Hardingham Station on the Great Eastern Railway. Apply to W. F.Francis, Auctioneer & Land Agent, London Road, East Dereham. FOR SALE. 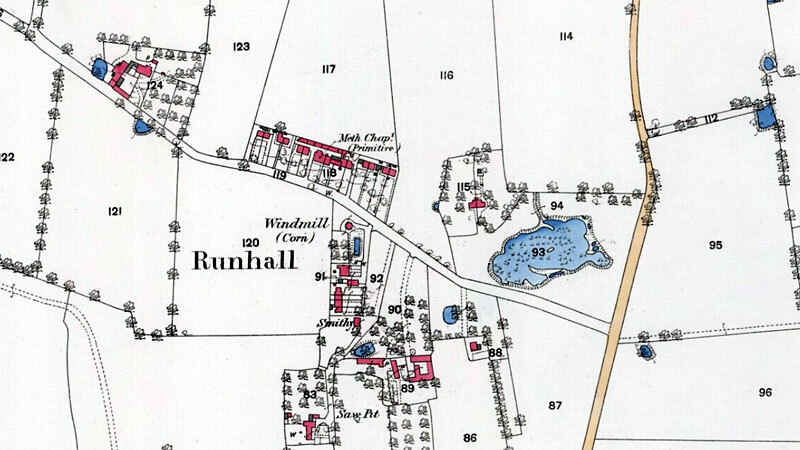 FOUR COTTAGES, Freehold, situate in Redenhall, (Runhall 21st August) Norfolk; also a Flour bfick WINDMILL. a MILL HOUSE and BAKE OFFICE. Good Stables etc. Apply to Mr. William Breese, Redenhall, (Runhall 21st August) Norfolk. Wanted by Single Man, as MILLER, with good reference. Apply, Mr. Sewell, Runhall Mill. 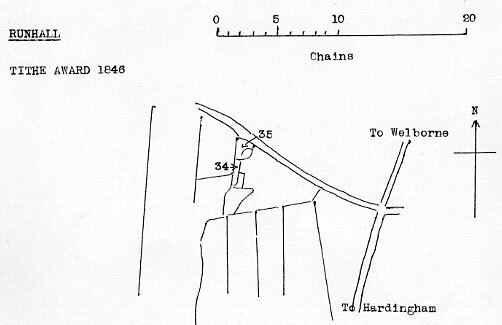 The following very desirable Freehold ESTATE situate at Runhall, Norfolk, in One Lot, comprising a capital DWELLING HOUSE with Bake Office, Cart lodge, Stables and convenient Outbuildings and Well of good Water; also a Brick TOWER WINDMILL driving three pairs of Stones, with a Piece of LAND adjoining, containing about Half an Acre, next the public road leading from Welborne to Hingham, in the occupation of Mr. John Ward. Possession of the above Estate can be had at Michaelmas next. Particulars of Mr. Fred Fox, Solr. Surrey Street, Norwich and of Messrs. Standley & Sons, Wymondham, Norfolk.